HMAS Air Watch was one of 21 air/sea rescue (ASR) vessels originally built in the USA and Canada between 1943 and 1945, and transferred to the RAN under the Lend-Lease Agreement. These vessels were originally designed as anti-submarine craft but their high speed and manoeuvrability made them ideal as search and rescue vessels. In this role, their hulls were painted black and their upper decks and superstructure painted bright yellow. 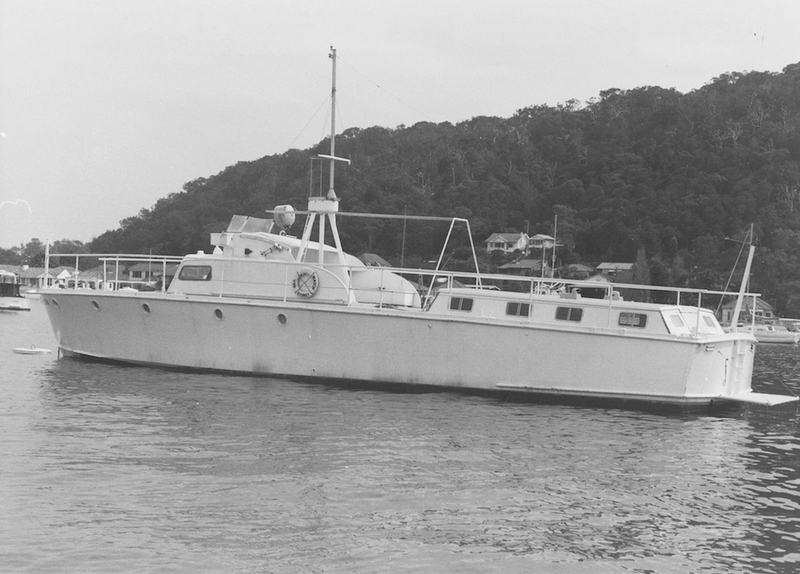 One vessel, HMAS Air Sprite, was built locally in 1960 to an almost identical design. Air Watch commissioned in the RAN on 27 November 1944 in Sydney under the command of Sub Lieutenant William Bath, RANVR. She was officially listed as a tender to HMAS Madang. Following commissioning she moored at Farm Cove until 10 January 1945 at which time she and a sister ship, HMAS Air Master, were towed to Glebe Island where they were lifted aboard the American liberty ship, SS Andrew T Huntington, for transport to New Guinea. Once out of the water, the hulls of both boats were found to be in a filthy state with no slip having been available to clean them prior to embarkation. The two ships’ companies subsequently busied themselves with cleaning the boats’ hulls during their northward passage. Andrew T Huntington arrived at Langemak, New Guinea, on 20 January 1945 where the two boats were unloaded; Air Watch by the ship’s gear and Air Master by a floating crane. Unfortunately, both boats suffered damage during the evolution; Air Watch losing a radar antenna while Air Master’s mast was smashed on the boom block of the ship’s gear. Repairs were undertaken at Langemak after which both boats conducted engine trials between 24 and 30 January. The pair then departed Langemak for Madang on 4 February. She was then re-assigned to Morotai where she arrived under the tow of HMAS Bunbury, on 27 May. Air Watch remained at Morotai for just a few days before departing for Labuan in company with HMAS Air Clan under the tow of HMAS Glenelg. The trio arrived at their destination on 14 June. While alongside at Labuan Air Watch experienced an air raid by a lone Japanese aircraft which was shot down after dropping just one bomb incurring no damage or casualties. At around 04.30 on 21 June, around 50 Japanese troops from the area of Labuan Island known as ‘the Pocket’, the only area of the island still held by the Japanese, attacked the town of Labuan where Air Watch was alongside. Allied garrison units mounted a hastily-arranged defence, and Air Watch’s crew stood by on the wharves with small arms. Over the course of the next two hours, the Japanese force was repelled for the loss one Australian and three Americans killed, and eight Americans wounded. Some 32 Japanese were killed during the raid. Air Watch provided occasional ASR cover near Jesselton (Kota Kinabalu), Malaysia, in July, during which time she took on board and transported to safety a group of Malaysians who had been under observation by Japanese troops. Later, on 6 October, she rescued a pilot who had crash-landed his Kittyhawk aircraft on a beach near Kimanis. She returned to Morotai in January 1946 where she primarily performed harbour duties before returning to Australia. Air Watch decommissioned at Brisbane on 24 September 1946 and was transferred to the RAAF in 1949. The vessel is now believed to be in private hands. Air Watch following her sale to private hands.